The research into the non-material art for the final work Computational Arts-Based Research and Theory class. Entering the world of Bill Viola one becomes painfully aware of the passage of time and the rawness of existence. Its limitations, to be more precise. Even better – the aging of the skin, the passage of time visible on the skin of the humans in his works. For the research into installations and non-material art, Viola’s works provide a door into the medium as an essential part of the message. Viola calls himself a ‘sculptor’ of time and uses video that is a heavily time-based media. The hauntingly beautiful and simple installation captivates you with its almost therapeutical repetition and slow, carefully color coded image. And the message resonates because you are the Messenger – you have been at the point of realizing the circular nature of existence. From the simple visual symbols, the meaning is immediately grasped. Viola’s work does not ask of us to have certain backgrounds or to stand in front of works for hours. The message is readily there, at points it seems even overly obvious. But this “obvious” is awkward, disturbing, rich with meaning. It calls on your synapses and connections. There is nothing happening because nothing should be “happening”. You are the one that should be happening. What I find relevant to my own work is the usage of the visual medium to portray the feelings and inner states of fear, dreams, deeper inner questions. It is not “the story” based installation, it is more of a rich symbol depicted yet again in an almost overly simplified manner. It is a new meaning given to the “overused” visual. And it is a meaning coming from your own perception. Is the Messenger Jesus? Is it just a human that goes in and out of life like water coming up and down the shore? Is it the artist? Is it an actor? But does it really matter? No. Similarly to the Tryptich Of Nantes, it is almost blatantly clear what is going on. The birth in POV, the clueless float that is life in the middle and death at the end. Similar with the two figures using a flesh light to find eternity on their own aging skin. What is there else to say? It is almost as clear as a short joke! Once you come inside the world of the simple, immortal questions resurfacing again and again in front of artists and a human you come to realize that the search is for a non-material, lasting, projecting dimensions. And it is very very slow. The actual time ceases to exist because is determined by his works. And it opens you up to search for the answers and the completion of the work – within. Bill Viola – Michelangelo. Life Death Rebirth. Exhibition at the Royal Academy of Art, London, catalog essay by Andrea Tarsi. 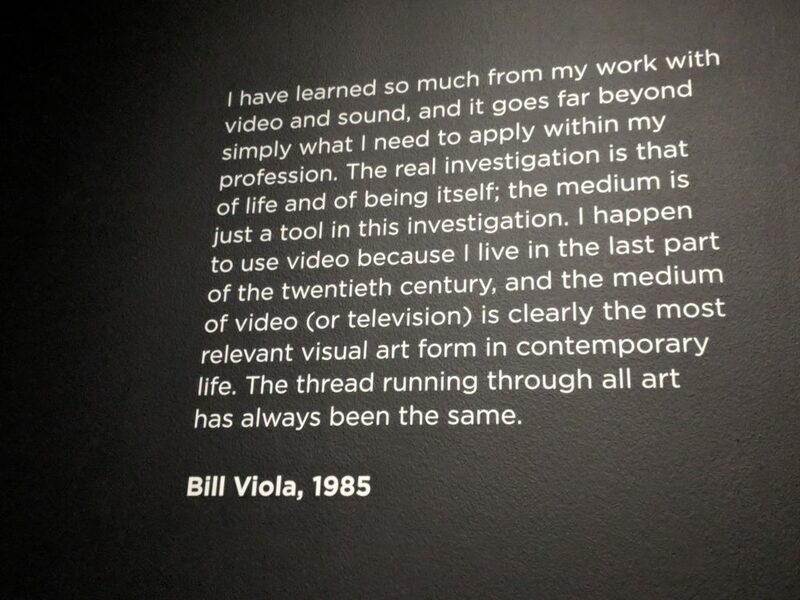 Images in order of appearance – The still from Triptych Of Nantes and the quote from Bill Viola from the exhibition space. Cover image, Bill Viola: Man Searching for Immortality/Woman Searching for Eternity (2013), color projection on black granite.